They are NOT insects! They are more like crabs. They have seven pairs of legs and move very quickly. Where seen? These nervous little animals are commonly seen on almost all our shores, often swarming in large numbers at low tide. 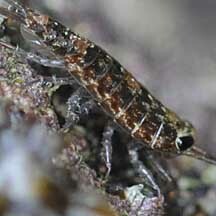 They are common on rocky shores, also among mangroves. What are sea slaters? 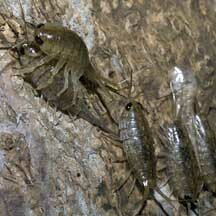 Sea slaters are sometimes called sea cockroaches. 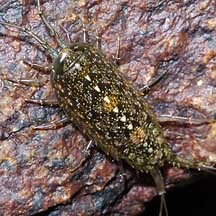 Although sea slaters are also arthropods, they are not insects! They are crustaceans like crabs and prawns; but are very happy out of water. Features: 2-3cm. 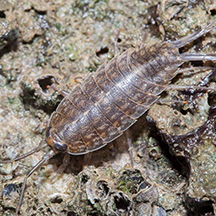 Sea slaters have seven pairs of legs and move very fast! 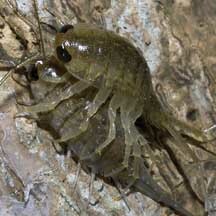 They have huge eyes and very long antennae. They are well adapted for life out of water, breathing air directly through 'pseudo-lungs'. On a mangrove tree trunk, a slater party? ...with hanky panky going on? 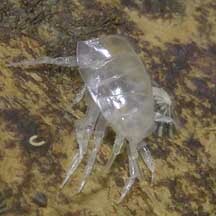 Slater babies: Sea slaters brood their young in special pouches. 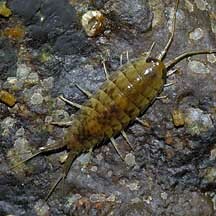 The young are released as miniature adults instead of free-swimming larvae. Empty skin left behind after a moult? Feeding on recently destroyed barnacles? 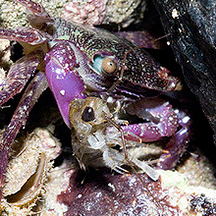 Captured by a Purple climbing crab. Order Isopoda Tan, Leo W. H. & Ng, Peter K. L., 1988. A Guide to Seashore Life. The Singapore Science Centre, Singapore. 160 pp. Mangrove sea slater (Ligia hawaiiensis) Ng, Peter K. L. & N. Sivasothi, 1999. A Guide to the Mangroves of Singapore II (Animal Diversity). Singapore Science Centre. 168 pp. Ligia exotica (Isopoda: Ligiidae) Sea slater by Tan Yen Yi, 2016, on taxo4254. 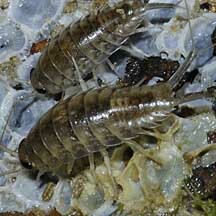 Isopods and amphipods and Marine slater on the Life on Australian Seashores by Keith Davey on the Marine Education Society of Australia website: Fact sheet, diagrams. Ligia exotica by J. Masterson on Smithsonian Marine Station at Fort Pierce.